Quick Tips Videos & Sales & Marketing for Professional Services & Sales Tips & Strategic Issues3 simple steps to "automate" your Linkedin Thank You message	Quick Tips Videos & Sales & Marketing for Professional Services & Sales Tips & Strategic IssuesHow much is too much? 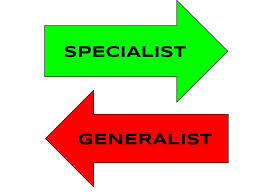 Generalist or specialist? This is an ongoing dilemma for many professionals – and there is a widely held belief that the specialist is harder to do. Let’s look outside the world of professional services and into the highly competitive, no-room-for-mistakes, world of the Olympic athlete and consider what goes into being a specialist or a generalist. A world class “sprinter does an hour of training a day but for a decathlete it’s three or four hours” according to Daley Thompson, the former British decathlete and two time Olympic gold medallist in the event. I am not sure if one hour for a world class sprinter is totally accurate today or not, but it was probably true some years ago, and certainly Thompson believed that to be the case when he made the statement in 2012. Todays decathletes and heptathletes train twice a day, for about 3 hours a time, and do it 6 days a week. That is a heck of a lot of work going into being world class at 7 or 10 disciplines. It is a heck of a lot less work going into being world class in a single discipline. In a service business we sometimes have no choice in reality – some business HAVE to be generalists. If you live in a rural area for instance and are working with an incredibly diverse clientele with a myriad of issues, then it is incredibly difficult to specialise profitably. Being a generalist is actually the only model that makes sense if you are going to have a profitable business which provides value to the local market. If however you are not faced with such limitations narrowing your business model choices, then there is little doubt that being a specialist is actually easier. It is not necessarily easier to become a specialist – it is just easier when you get there. Achieving excellence in any single discipline is tough. Achieving excellence in multiple disciplines is beyond most, and requires a level of focus. commitment and energy which is tough to maintain for a long period. 1. work hard and long to become an excellent specialist, whereupon you get to work hard to maintain your excellence. 2. work long and hard to become an excellent generalist, whereupon you get to work both long and hard to stay there. Personally, I’d rather do the sprint training. That decathlon stuff looks like a lot of hard work, and leaves no time for sitting in the sun drinking wine.